Independently of the unrealistic calculations and considerations by which he tries to demonstrate the incompatibility of Kola’s findings with the mass murder he denies, Mattogno of course doesn’t feel comfortable with graves of such area and volume having been found at all at Belzec. What’s more, as we have seen above, nine graves had been opened by order of Regional Investigative Judge Godzieszewski on October 12, 1945. The local population continued to dig in the area of the camp until the early sixties, at which time it was transformed into a monument and surrounded by the present enclosure. How many graves were dug up in those twenty years? The diggings took place in total disorder, without any regard for orientation, order, or symmetry, which explains the total lack of orientation, the confusion, and the irregularity of the graves identified by Kola. In the course of these diggings, the walls which had originally separated the graves were destroyed, deceptively enlarging the graves. Furthermore, as we see from Kozak’s testimony, the soil removed from the graves was spread across a large area of the camp, leaving ash and human remains exposed. When the graves were refilled, this mixture of soil, ash, and human remains ended up both in places which had originally been earthen walls separating the graves, and in holes here there were originally neither remains nor ash, thus creating the illusion of more numerous and more extensive mass graves. 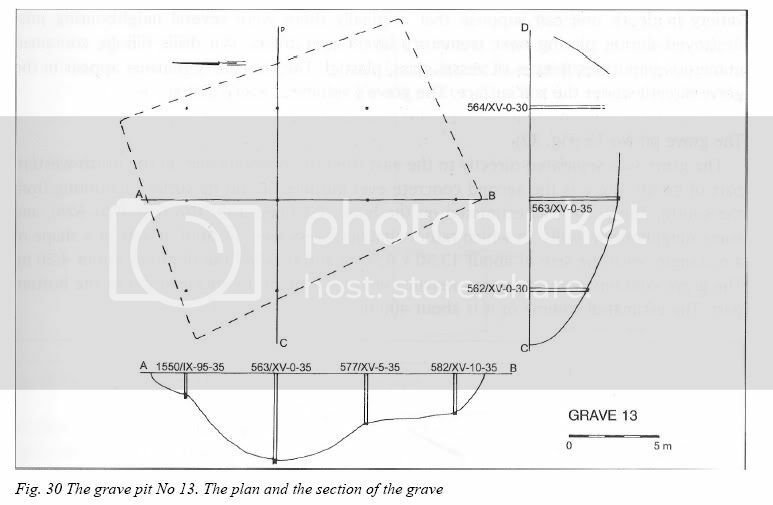 The presence of saponified corpses in limited areas of three large graves (see section 3.1.) can be explained in this way, or by the enlargement of graves that had initially been smaller. The drawings of the soil samples that were taken provide further confirmation. As we have seen, of the 236 samples taken in connection with the graves, 99 are irrelevant and more than half of the remaining 137 show a very thin layer of sand and ash. 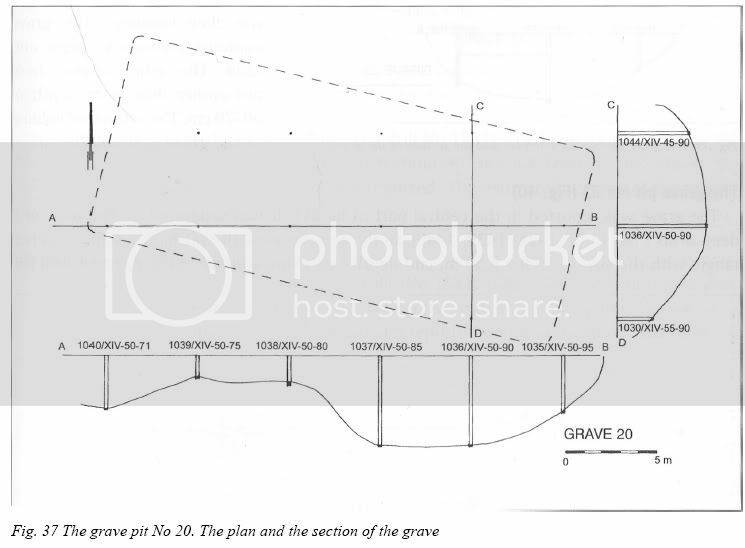 What is more important, however, is the fact that there is often a difference between samples in a single grave, with very thin and very thick layers, as shown for example by graves No. 3, 4, 6, 7, 17.281 Such a variation in the soil strata can only be explained by the inclusion in the grave of soil from an area that did not initially belong to it. In the zone between the graves No 12, 13, 14, 24 in surface layers the drills showed numerous damages of grave structures, probably caused by levelling works or robbery digs. 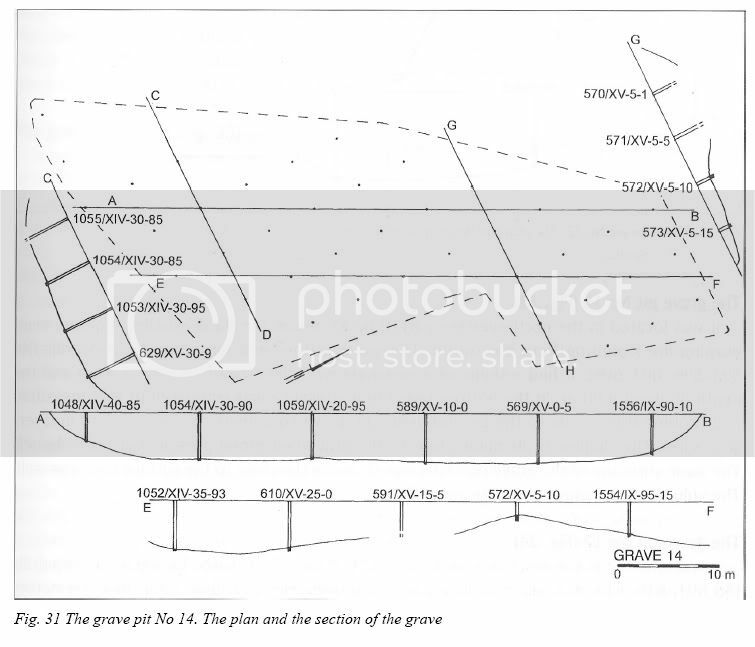 Yet the modifications of the grave structure due to robbery digs don’t change the fact that the area of most of the graves identified by Kola (26 out of 33, by my count; readers are of course invited to look up the figures shown at the end of part 2 of this commentary and decide if they agree with me or not) has a regular geometric shape (square, rectangle, trapezoid), as also becomes apparent from the quotes of the grave descriptions in part 3 and section 4.5. It stands to reason that these regular shapes can hardly have been the work of grave diggers. The graves where I see an irregularly shaped area are graves nos. 5, 9, 12, 13, 14, 22 and 29. Grave # 5 has a regular shape on all sides except the upper right corner, where it looks like some kind of obstacle hindered the making of a regular edge. Graves nos. 12 and 13 have a fairly regular shape in all but one corner, where the original grave structure may have been changed by a later extension of the grave carried out by the SS or due to the robbery digs mentioned in the above-quoted description of grave # 13. 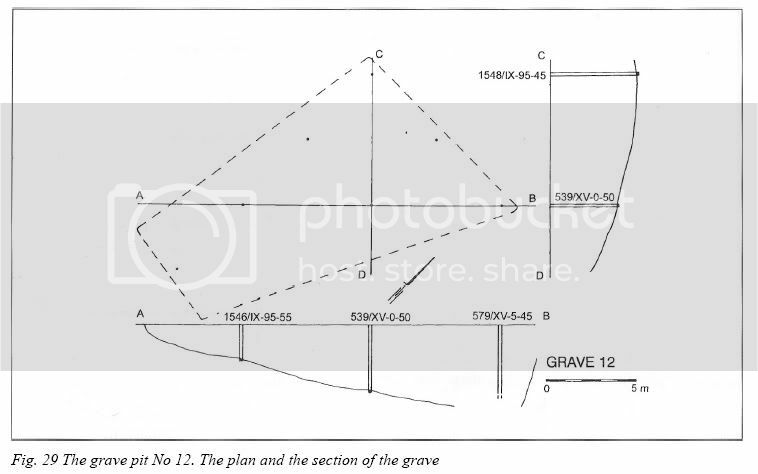 The irregularly shaped grave # 14 is presumed by Kola to have resulted from a merger of "several neighbouring pits, destroyed during placing next crematory remains over them", see the quote in section 4.5. 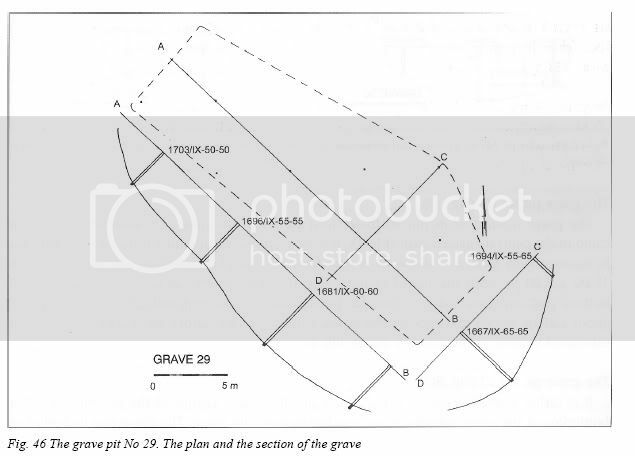 Grave # 22, with roughly the shape of a rectangle diagonally cut in half, shows signs of "close to the surface destruction of the grave caused by the alley building", as Kola states on page 34. 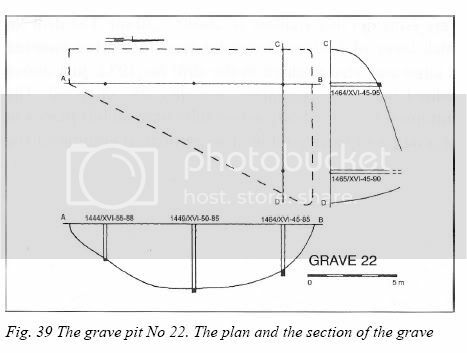 Grave # 29 has a mostly regular structure with a bulge on one of its sides that looks like the result of a later extension, either by the SS camp administration or by robbery diggers. The only grave for the irregular shape of which no ready explanation can be found is the relatively small grave # 9. The irregular surface shape of the other six irregularly shaped graves can be attributed to modifications of the structure of graves that originally had a regular shape. 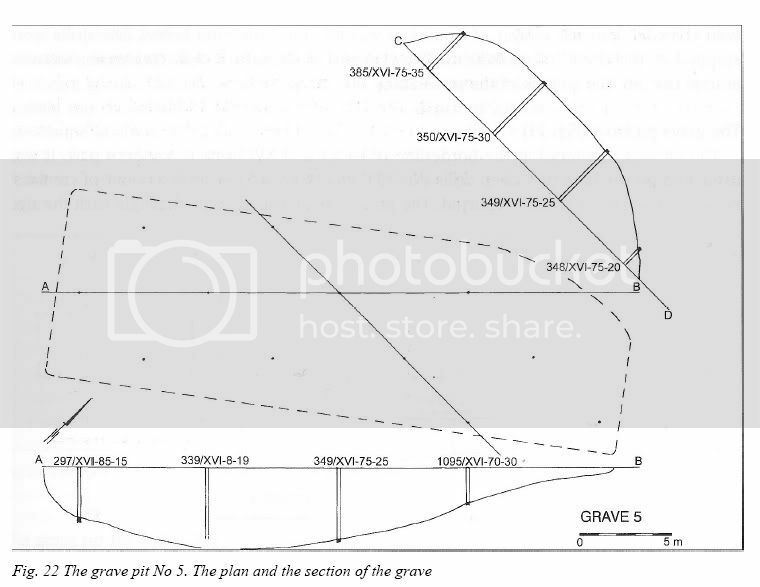 Within a reach of the grave 2 deep pits were reported, which made the archaeologists suppose that there had been previously 2 neighbouring graves (in the part, where the graves were connected the layers are considerably shallow to about 1,20 m). Graves nos. 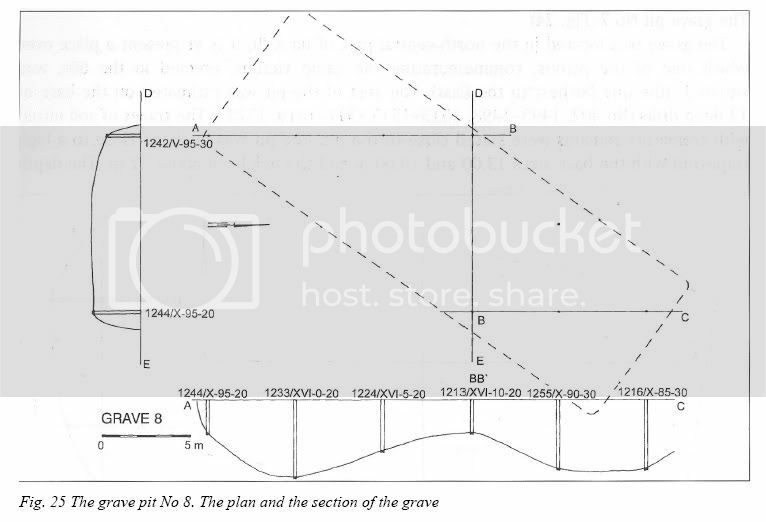 8 and 14 are stated to be the result of the merger of two or more originally existing graves, which alone seems sufficient to explain the "bumps and holes" shape of the bottom. The bottoms of all other graves, as I see the sections (readers are again invited to look up the figures shown at the end of part 2 and decide if they agree with me or not), are shaped either like a tub with a fairly regular bottom or like a swimming pool progressively deepening towards a certain spot. These shapes may be related to the composition of the soil at Belzec, which was made of sand or sandy loam and would thus make steep rectangular walls unadvisable as these would more easily cave in. Robbery digs may also have influenced the present shape of these graves’ bottoms, but Mattogno’s claim that the graves in general "give evidence of the activity of wildcat diggers, certainly not of excavations of mass graves aligned in military fashion" is something of an exaggeration and also belied by the mostly regular shape of the graves’ surfaces. Contrary to what Mattogno surmises, the SS personnel of Aktion Reinhard(t) were no military trained specialists in grave digging, by the way. Most of them came from the previous Aktion T4, the killing of physically and mentally disabled patients in mental health institutions falsely dubbed "euthanasia", and are unlikely to have undergone proper military training. Besides, it was not the SS staff or the Ukrainian guards who dug out the mass graves, but this was done either by hired Polish workes or Jewish forced laborers, who would not necessarily known how to make and align graves "in military fashion". Aligning the graves too close together, as pointed out in part 2, might also have made the walls in the sandy soil too thin and likely to collapse, apart from difficulting the removal of the soil taken out of the graves. As becomes apparent from the above, the possibility of several graves merging into one, which Mattogno addressed, was duly considered by Kola and included in the descriptions of the graves where it was found to have occurred, namely in graves nos. 8, 14 and 20. The descriptions of these graves and the other descriptions mentioned in this section show that it was possible for Kola’s team to detect and identity mergers of several graves into one and other modifications of the original grave structure, which in turn belies Mattogno’s conspiracy-minded assumption of a postwar manipulation of the number and size of the graves. This speculation of Mattogno’s is further rendered improbable by the regular geometric shapes of the area of most graves and by the alternating placement of layers of ash and sand identified by Kola. The latter, as explained before, corresponds to the above-mentioned testimonies about the victims’ ashes being returned to the graves after incineration (see quote from Yitzhak Arad in section 4.5), which I presume were mostly made in the course of investigations by West German criminal justice authorities and trials before West German courts. It is not understandable what far-reaching conclusions are supposed to be drawn from the fact that – as Mattogno again claims to have detected on hand of his keen observation of the schematic representation of a part of the drill samples – "there is often a difference between samples in a single grave, with very thin and very thick layers". What is this supposed to mean, other than that the alternating pouring of ashes and sand into the graves did not always occur in layers equally thick and/or equally distributed throughout the grave? The "inclusion in the grave of soil from an area that did not initially belong to it", also claimed by Mattogno, allows for no conspiratorial conjectures either, for the SS already would hardly have endeavored to refill a grave with exactly the soil that had originally been taken out of it and in the meantime probably been mostly stored somewhere else inside or outside the camp. So it looks as if Mattogno has been desperately been fishing for reasons to question the reliability of Kola’s investigation results regarding the location and area of the mass graves, without managing to produce any substantial arguments in this direction. Mattogno’s nonsense about the 99 "irrelevant" soil samples, repeated in this section of his book, was already addressed in section 4.5 of this commentary. Therefore, the purely theoretical assumption that the original mass graves could have contained 170,500 corpses is without physical basis, and the actual figure should be considerably lower. The fate of the Jews sent to Treblinka is also reflected in a report noted in the October 10, 1942, entry to the War Diary of the Oberquartiermeister of the military commander in Poland. OK Ostrow reports that the Jews in Treblinka are not adequately buried and as a result an unbearable smell of cadavers pollutes the air. Ostrow, it should be noted, was some 20 kilometers from Treblinka. 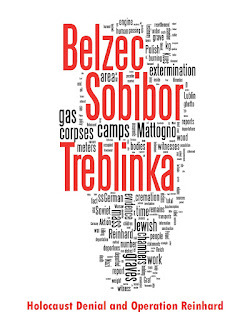 Of course such phenomena of far-reaching environmental smell pollution are not compatible with the generous use of the grave volume for relatively few corpses in the mass graves found at Treblinka I labor camp, but they are certainly compatible with an extermination camp’s huge mass graves filled to bursting with corpses that had not simply been thrown in there but carefully placed in such a way as to allow for putting the greatest possible number of corpes into the each pit. Thus Mattogno is comparing apples with oranges here, a popular tactic of "Revisionist" hoaxing. With this I arrive at the end of the analysis of Mattogno’s assessment "whether the volumes of the mass graves identified by Kola and the amount of ash from human beings and wood the graves contain are in keeping with the mass cremation of hundreds of thousands of corpses". 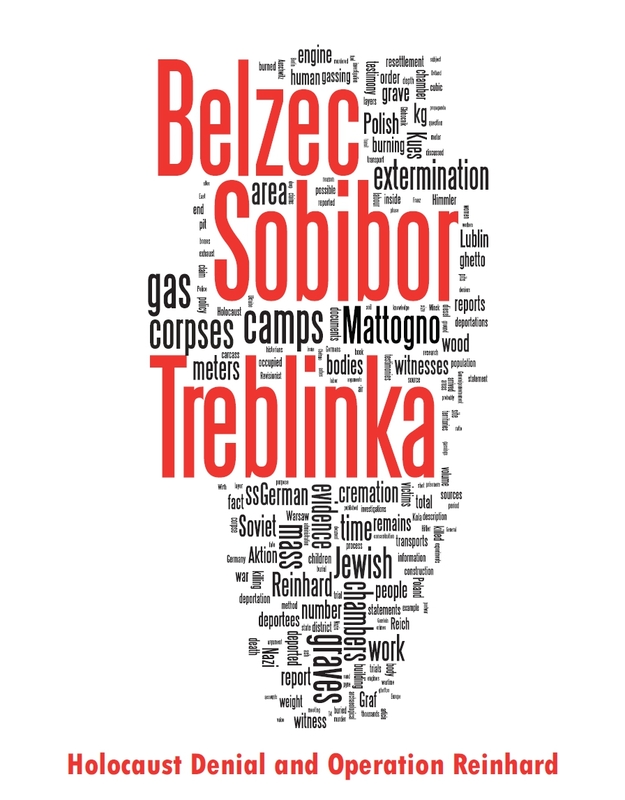 As the result of this analysis it can be concluded that all of Mattogno’s objections against the compatibility of Kola’s findings with the other evidence to the mass murder at Belzec can be dismissed and that what Mattogno calls the "official historical version" is corroborated, not contradicted, by the findings of Prof. Kola’s archaeological investigation.